Listen to your favorite stations without the crackle you may have had to put up with on your traditional radio. Set your desired alarm - wake to a tone or digital radio. 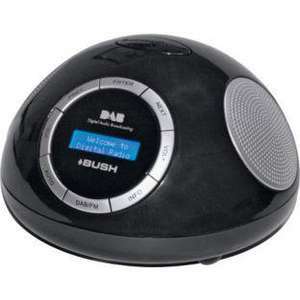 This Bush DAB alarm clock radio has two alarm times, so you can set one alarm time to wake you up and the other to wake up your partner. Bought one of these once. Returned it. The clock is tiny and difficult to see. Not really what you want from an alarm clock. From an alarm clock radio i would say i would want it to play an alarm at said time and play a radio. Not bothered how big the read out is!! From an alarm clock radio i would say i would want it to play an alarm at … From an alarm clock radio i would say i would want it to play an alarm at said time and play a radio. Not bothered how big the read out is!! It might not be important to you but I have to agree with col996s, the clock display looks far too small, particularly if you wear glasses. No stock in North West, as far as I can tell.